First off, I want to thank you all for the comments and suggestions on my last post! You guys had a million ideas. I started responding to all the comments and World War 3 started in the basement over a yellow Lego (apparently the last yellow Lego in the universe completely intrical to each of my two angels current Lego creations). Many of you wanted my oars from the old house back, and I actually have a plan for those over the stairs now. I’m just waiting on something I ordered to arrive and I’ll keep you posted! Ok, onto this beast of a living room. I know I have kept you all waiting on this one with good reason! This room is so unbelievably hard to photograph because I don’t have the right equipment. I really need a wider angle lens to be able to fit the entire room in the frame, and I think I’m going to have to break down and buy an external flash because of the crazy amount of light that bounces in here; every photo is blown out or pitch black. I’ll quit boring you with my photography woes and just show you what I got for now to give you an idea of the room, but photographers hit me up if you have a favorite wide angle lens you suggest or ideas how to shoot this room. Let’s talk about this couch. The Mr. had like zero requests for this house and really let me run with what I wanted except he put his foot down on one thing – a comfy couch. Our living room furniture at our last house was pretty, but we never sat in there. It really wasn’t comfy and there wasn’t a place for all of us to sit. He wanted a huge, deep sectional that he could actually sit on in person/lay down on for an hour in the store like a couple of weirdos and make sure it was comfortable. There are not a ton of furniture stores near us that had anything that fit the bill. Ok, enough about my couch buying experience (I just thought I should warn you all not to drink margaritas and couch shop) I do really love how this room turned out and we totally live in here when the weather stinks. I don’t have it totally styled perfectly, I sort of just threw some old stuff in here so it doesn’t feel so empty and cavernous. One thing I do love and will be staying is our Dash and Albert rug. I had this rug picked out before we even broke ground on the house. The stripes look black in the pics, but are actually navy. I wanted something with a classic feel and pattern on the floor, but the jute makes it really practical and it hides sand and dirt really well. 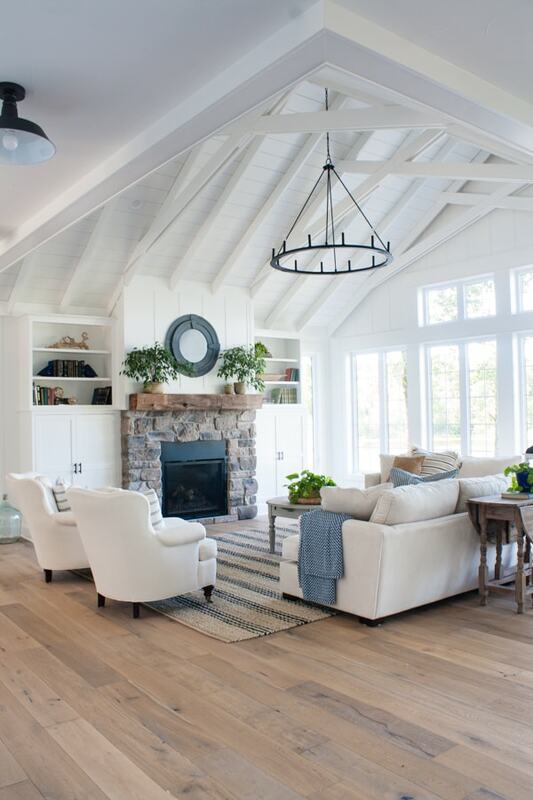 It’s hard to pick if the ceiling or the windows are my favorite – it’s a pretty close race. I have gotten a lot of emails asking me to share the exact dimensions of the ceiling situation and honestly guys, it would not be helpful to you unless your room is the exact same dimensions and the pitch of your roof is the exact same, my best advice is to hire someone who knows what they are doing (or drink some margaritas and give it a go)! This next photo looks totally weird and shadowy (well all these photos are a bit weird and shadowy), but it was my best photoshop attempt at showing you the view out the windows. I really need to figure out a video tour to capture it better. I realized I didn’t grab a great pic of the fireplace builtins, but I’ll let you in on a blogger secret – typically when I shot my last home I moved my entire couch out of the room so I could get an unobstructed shot. I basically take my whole house apart and put it back together to get nice photos which is why everything looks perfect and not cluttered or messy. This is not that, because it’s summer and #reallife I just pulled my camera out and took 20 minutes worth of pics. I hope to do a more detailed post on the cabinet and how the tv is hidden inside this fall maybe. Ok, I’ll stop rambling. Can you tell most of my conversations this week have been with a 6 and 9 year old and I’m in need of some adult conversation? Your house is beautiful, I look forward to every post! Love the openness of the tall ceiling and all the natural light from the windows. I also love the DIY mirror about the fireplace, you did a great job. Do you have more details about this couch? I live on a lake in Washington and this couch looks perfect. We have been on the hunt for a while and can’t find the right on yet. I’m using this page as inspiration! I usually admire without commenting, BUT THAT VIEW OF THE LAKE!!! INCREDIBLE!!! I, too, look forward to your posts. You have created yet another amazing home. Your rug has inspired me to purchase one for my home! Thank you and enjoy your summer with your family! Hi Tracy thanks so much!! I accidentally linked the wrong rug the first time, so I hope you didn’t already purchase the rug. It should be right now – thanks! Looks so beautiful!! The view is the best! I’m a photographer. I love my 35mm, but a 24mm might be even better for your needs. In terms of trying to show the view, one trick you could try is to put your camera on a tripod and take two photos–one where the outside is all blown out but the room is properly exposed, and an identical one where the room is dark but outside is properly exposed. Then you blend then together in Photoshop! Easy peasy and no need for an external flash! Hi Meghan, I’ve watched a tutorial on how to blend them together but I only have lightroom right now. Maybe the better investment would be photoshop? Worried about the learning curve with that one.. I’ll look into a 24mm thanks for the tips! The room is beautiful – but one question that I have always wondered about – when we position our sofa/chairs that way what do we do about lighting? Did you have plugs installed in the floor – which would interfere if you ever wanted to rearrange furniture – or do you run cords across the floor? I have a large family room as well – I have lighting in the ceiling, an overhead light in the cathedral area, and 4 lamps on tables, as well as lanterns with battery candles on the mantel. So many pictures I see on Houzz do not have any lighting at all. Can you help? Gorgeous job – every detail. Hi Sandy I have a plug in the floor under the middle of the rug so I can run a cord beneath the rug if I ever want to put lamps in somewhere. I had planned on a floor lamp by the couch but so far I don’t mind not having one. We get so much natural light in here that I’m not sure I would need a lamp. Can you tell me the dimensions of the rug and room where the furniture is? Beautiful room and looks comfortable! Hi Jennifer it is super comfortable in here. This room is 22 x 22. Sorry Laural they aren’t available for purchase – thanks! Your living room is stunning. I can’t imagine how amazing it must be to enter your home and see that view! Everything including the sofa 😄 Looks amazing! Oh my word……words fail me in trying to describe what I feel when I saw the pic with the outside view…..you would find me there….just sitting….maybe some beautiful music playing….just sitting and abiding….and resting…..I may or may not do my quilting….or maybe just sit with a lovely cup of tea..,..,and just spend the rest of my time trying to figure out how I was so blessed! Another scenario, if I got a rare burst of energy….is to put on some old music like Huey Lewis’ Power of Love and crank it up and just be bop around…looking totally ridiculous if anyone was to walk in and see that this old lady could still move like that at all! hahaha that made me laugh out loud, have a great week Marie! Your house is simply stunning. Every room is gorgeous. That view is priceless. I can see why you can’t decide between the windows and ceilings as your favorite thing about this room … I love them both. That ceiling, though. Obsessed. The windows and view beyond are amazing …love everything. Thank you for sharing. Oh! WoW!! To be honest, at first, I thought you were daft for selling your other house and going through the angst of building. Well, don’t I have egg on my face!! The house is turning out totally beautiful and the view is phenomenal. And margaritas are always good when making decisions — a lot easier to do. And I wish I could give you photography advice. I go through the same issues on lighting but I’m learning. Depending on whether you have a full frame or a crop frame camera — there are a lot of great lenses out there. If you have a full frame I believe a 28mm would work great and for lighting issues. I believe a light umbrella might work out — you wouldn’t get the super dark photos and you get set up a white sheet opposite the umbrella to bounce off the light. I can’t wait to see the rest of the rooms. Hugs!! Give that little guy who’s posing a pat on the head! Thanks for the tips Marisa, I should try the white sheet idea in the fall when I have more time. You can borrow my camera that has a wide angle and external flash and play with it for a couple weeks if you want to Kelly. Mostly I’m using a pro or my cell phone now. That would be amazing Kay, I would love to give it a try before I spend the money. Thanks for the offer! Love your living room! Can’t wait to see your TV setup in the cabinet – great idea! Really like your rug! I’d also like to know what size you used for this seating arrangement. Your photos look great to me! Hi Linda, this rug is 10 x 14 I believe and our room is 22 x 22. Wow! An absolutely amazing room! Those windows!!!! And I love the one photo where you can see every amazing light fixture. You did a beautiful job…dream home right here! Love, love the room. Just fresh and beautiful. I have a rug question. I love the rug, but the one in the link picture looks different and darker then the one you have. Is that the exact same. The one in the link has three stripes in each section. It looks to me like yours is showing four. I love the rug! The view makes it a dream house. You did a great job with the design and the decoration. I really love it. What a gorgeous view!!! I would turn the bench around and sit and look out at the water all day! I don’t think I’d get anything done if I lived in your home! Enjoy it! STUNNING!!!! I love how cozy and welcoming the room is even though its HUGE! and that VIEW!!!!! I’d never leave….so the couch has to be comfy! I just love your home and so enjoy every post. The view out the windows to the lake is stunning. I think I would get up every morning and stand there and look out with my cup of coffee in hand and thank my lucky stars. Enjoy the journey. Love, love, love your space and your choices. I also have a husband that wanted a comfy couch, then bought him a leather club recliner and he never a sits or lays on the couch. Go figure! Your pictures are great and your room is amazing. The windows, the ceiling, the light fixture, the furniture ❤️ It all works and looks lovely. I’ve enjoyed watching your building journey. So fun!! You house is amazing. 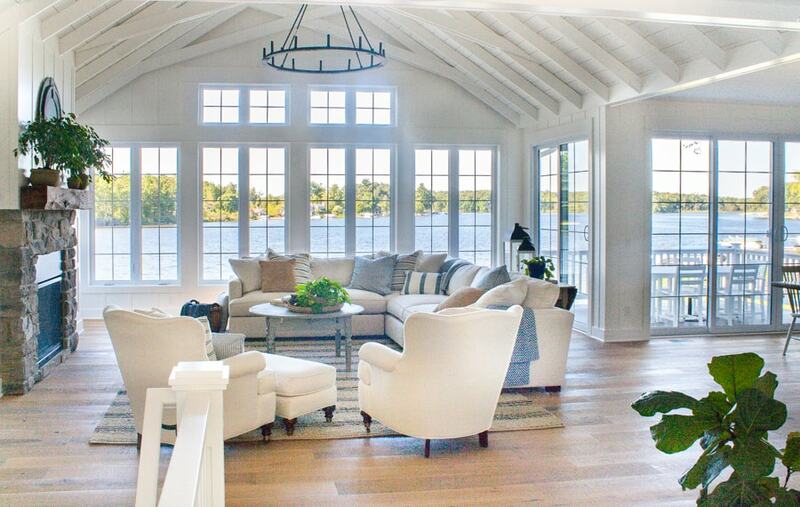 Love your decor style and love that lake view. Love it all! The colors, the light fixture, the dog…! Magazine worthy for sure! That’s is beautiful! The room, the ceiling, the view. All of it. Just stunning. I’m in the market for a new couch too and shopping for it stinks. I would love to be able to have a nice white/cream couch but my hubs is oblivious to taking off his work clothes before sitting on it. I know it will never work, but I still dream about it. I love everything you’re doing with this house and wish you could post everyday! 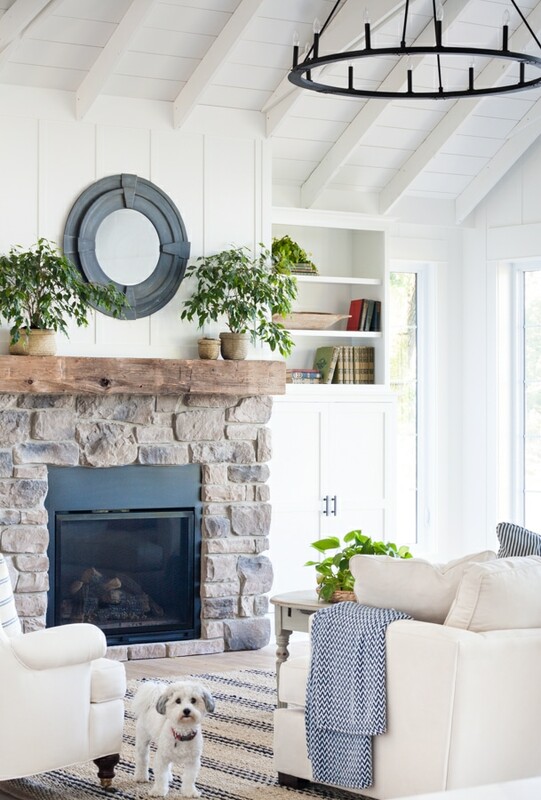 What type of plants do you have on your fireplace mantle? Thanks! Oh my goodness. No words. This is just a dream space! In fact, your entire house set up is perfection! How amazingly lucky to happen upon a property with that gorgeous lake view AND a pool?! Also, please do NOT apologize so much for your photos – no need to! They look amazing and all of us regular people who don’t have blogs or fancy cameras do not care at all :) Though I can understand wanting a good picture with that view. Wow!! You should be very proud of the space you have created and I can’t wait to see more! This is beautiful and I’m really regretting not moving to the lake right now! I have the same issues photographing my house too. The windows and the high ceilings make it impossible to get a good photo. Your home is beautiful. We have just purchased a home on the water in Ontario, Canada. I love your rug. I like it because I have a black lab and I want something that will work with family members coming in and out of the house. Can you share more details? Dimensions, name of rug? I see that it is a Dash and Albert rug, but I am unable to source it. Thanks! Le sigh. It’s all so perfect!! And that last pic with the dog just melted me. I’m gonna need a blog post on the doggo, stat. Ha, he kept popping his little head in all the pics! Really lovely all around. 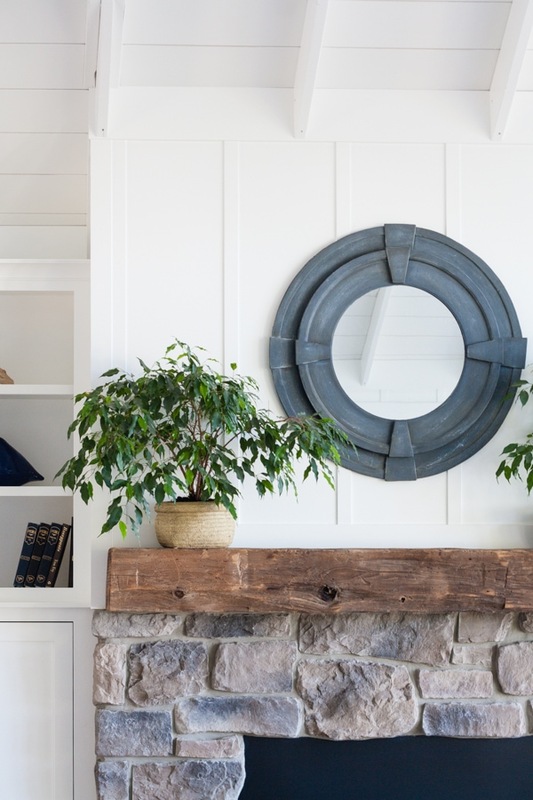 Love the mirror above the mantel. Did you post about how you did it? Every time I view your posts, I feel like I’m going to hyperventilate! You would think that you were designing it just for me. I absolutely love everything you have done! You lucky, lucky lady!!! I bet you could do cartwheels every time you walk in the front door and see that amazing view of the, lake. Absolutely beautiful and inviting. I’m loving following along on the lake house. Beautiful! Can you share what paint finish (flat, eggshell, etc.) you used on your walls and ceiling? Thanks for sharing. Wow! Just wow! That wall of windows with that view!!! I love your couch! We just purchased a white couch and I am scared! What a beautiful home!!! I am so happy for you! You are a talented decorator!!! OMG what an incredible view!!!!! Almost makes me want to move to Michigan!!! Your home is stunning! Always love seeing your latest (such good taste/talent)! I’m interested in the floor information as well. Thank you for sharing your resources. So beautiful! I am really enjoying seeing all the areas of your new home. It’s amazing! For photography, I highly recommend taking the Photography 102 class from shootflyshoot.com. They talk about shooting interiors, using a flash, editing, and more. It’s not a terribly expensive class, they run sales from time to time, and the guys are great teachers! I love it!!!! You have done a fabulous job and your views are amazing! I am purchasing a new home and would like a sectional. The fabric and color you selected are perfect! I have dogs and a cat and I read that microfiber (faux suede) is very durable. I have an ArtVan in town as well. Can you tell me the name of the sectional so I can test it out? Thank you! The room looks fantastic, and those views are incredible. 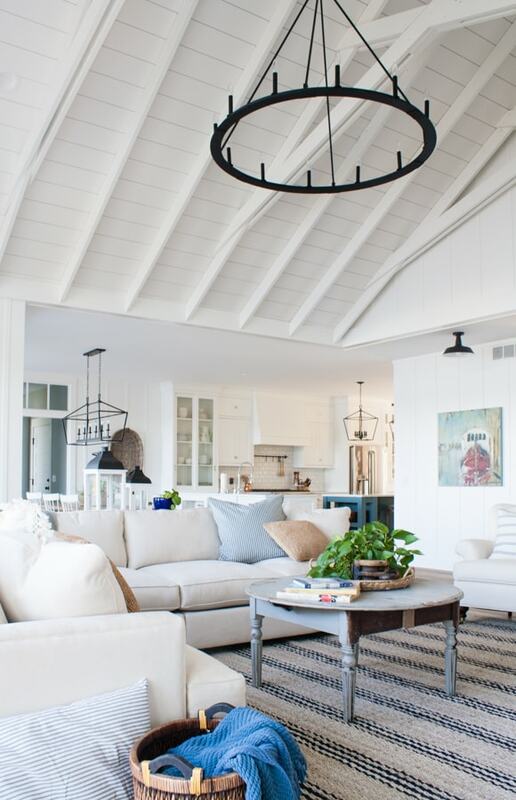 And I’m sure that couch is comfy, but can we talk about that amazing light fixture in the center of the room? 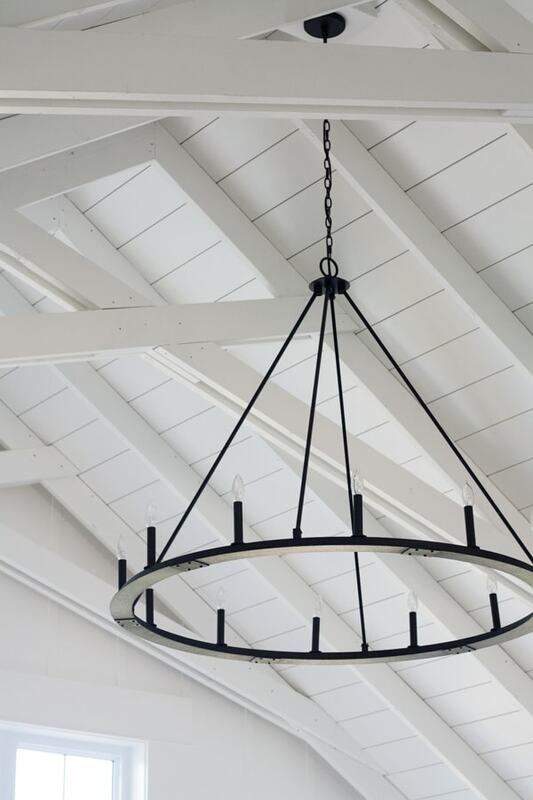 The black iron is a great contrast to the white wood ceilings. Is it electric candles? A candelabra? I love that sectional! Do you mind telling us what brand/model it is? Thanks! Beautiful home! I love the floor. Would you remember the details on the brand and name of it? I know it’s from Builders Direct but haven’t been able to find it. Is your sectional the Lincoln (?) collection from Art Van? I just started following you and Instagram a few weeks ago and I didn’t realize you lived in Grand Rapids. I am from Saginaw (I still have family there), but I’ve been in Nashville, TN for many years. Your IG stories make me miss Michigan! Your house is beautiful, and you are inspiring me to step up my game! Thanks Marilyn glad to have you following along, and Nashville is on my bucket list! If you decide you need a statue of an old lady, please call me and i will gladly stand in your living room until the end of time. adore your new home. best of luck and much happiness there. HAHAHA that made me laugh out loud! Thanks Joan. Do you remember the color of your floors? Your link takes me to the floors but has multiple color choices. Love them! HI Amanda I think they the color is Robin. Loving the new house and the living room looks great! I always look forward to your posts. The view is beautiful. Did you consider doors & windows that weren’t divided light? If so, what influenced your decision to go with divided light? Do you feel like they block the view at all or do they just “disappear” when you look out? I’m trying to decide which to use myself. Thanks in advance. Happy Summer!! 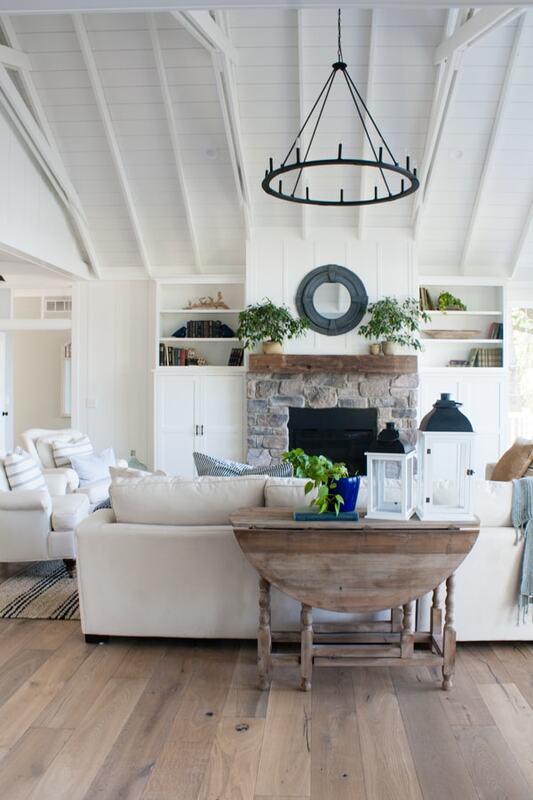 Wow, this living room looks so chic! I love the decor and the color pallete. Neutral and elegant. That light fixture, btw, so beautiful!! Oh my goodness, I absolutely love this space. And am obsessed with the flooring. Im curious if your stairs are the same product, if engineered flooring is do-able on stairs? Seriously cannot wait to see what projects you share next. Your space is inspiring. Yes it’s the same engineered flooring you just need to buy special stair nose pieces. Thanks! Do you call the treatment on the wall above the fireplace board and batten? I’d like to recreate in a small bathroom. Do you have any suggestions on how to recreate. Thanks for any tips. Your home is beautiful! I call it floor to ceiling board and batten yes. If you search that on Pinterest I bet you will find lots of tutorials for it! LOVE , LOVE, LOVE your new home and everything about it. Great job!!! Your location with all the water views is spectacular. I’ve been looking for new sofas (I like the white slipcover look) and notice your sectional and chairs are not slipcover but upholstery. With kids and fur babies, how do you keep it clean. I was going for the slipcovers because of the easy clean-throw in the washer, but I like the more tailored look of the upholstery. Hi Sandy they aren’t slipcovered but this fabric is supposed to be really easy to clean and we bought the lifetime stain warranty on them so if I can’t get a stain out they will send professionals to clean it and if they can’t get it out they will give us a new couch. So far I haven’t had any issues getting stains out, crossing my fingers! Beautiful room, love it from every angle. May I inquire the size of your entryway? thank you! Hi Ingrid I’m not home to measure but I’m guessing off the top of my head it’s 6 ft by 10? Do you happen to remember if your sofa is the Harper sectional from Art Van? If it is, how is it holding up? We are trying to decide about a sectional, and are having the hardest time. Your home is beautiful! Hi Kari, the only info I can find on our couch is that it’s made by Max Home it says Amalfi Oyster on it and the color is med khaki. We have only had it 6 months but love it. Thanks! How did you make that mirror? Also, who was your builder or architect? This is a perfect room! What type of flooring is this? Brand, Color, etc. Lovely space! Could you share where you purchased the mantle? Maybe it’s custom? Thank you! It was custom thanks Lee. When I click the Dash & Albert link above it takes me to Zola. Thought you would want to know. Oh, so sorry! I fully expected to go to the Dash and Albert site. Oops! Thanks for taking the time to let me know. Hi Janie – our home is about 3,800 sq ft of finished space. So far I haven’t dusted the beams lol so I don’t know about that yet! Our siding is a dark slate color but it definitely has blue undertones. On sunnier days it looks more blue and on cloudier days it looks more grey. It also photographs a bit more blue than it is as well. Thanks! Where did you get the hardware on ur built in cabinets? They were from a local hardware store I don’t have the brand name – sorry! Love this room. Whondering if your floors have a stain or that’s their natural color. If you check out my FAQ page I link to our exact floors they are engineered hardwood and came prefinished this way – thanks! I have a few questions about your couch. I too live in the midwest and have been working with Art Van to find the perfect sectional for our living room. We have had nothing but trouble with finding the right fabric. I think we have decided to custom order the Harper. So I guess my question is did you custom order it and if so we too are looking at more of the suede fabrics but I noticed they have somewhat of a v pattern on them so is it noticeable? Or does it look perfect? Hey Stacy! 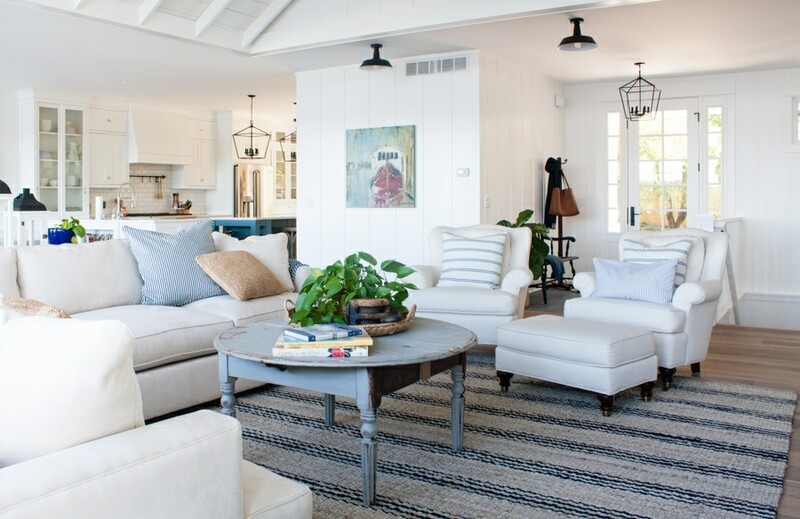 Check out a few posts back on my blog we just got a new sectional from Maiden Home. The fabric selections are fantastic and it’s more comfortable than the Art Van one but in a better fabric. It is a bit pricier than Art Van but the quality is so much better. I will say the Harper is in our basement now and it’s still a great sofa but I don’t love the fabric options. We basically chose the best out of not the greatest options. Our is sort of a microfiber that we custom ordered in the lightest color they had available. Thank you so much for the quick reply! As much as I would like to look around we are kind of tied down to ordering from art van right now to avoid some fees but may do the same, move it to the basement in a few years. With that being said we would be ordering one the of softer fabrics but in mocha or charcoal. Do you think those would be okay? And if possible could you send me a close up picture of your Harper sectional? I am just having a hard time imagining the sectional in the other fabric! Hi Stacy I didn’t look at any of those fabrics but we also purchased this 2 years ago now so it’s possible it comes in different options now. 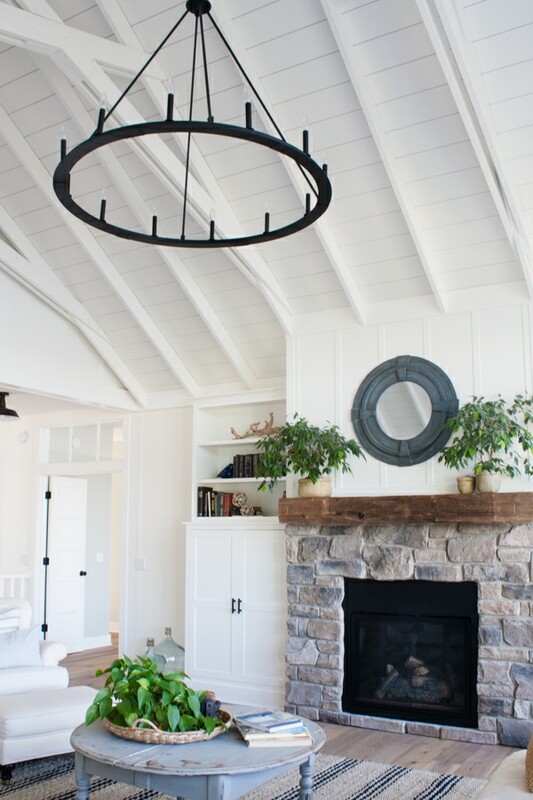 Hi Kelly, I love your house and especially your ceiling beams, which I hope to recreate in our house we are building in B. Please could you possibly tell me the size of the beams? are they each 1 and 1/2 inches thick? And they look to be 6 or 8 inches wide? Hi Lorrie, the planks are 8 inch MDF boards and the beams are just rough lumber I believe they are 2 inches thick and 6 inches wide. Thanks! Thanks Kelly for your quick reply, we are going lumber shopping today! Just to clarify…the decorative cross beams attached to a few of the beams are they the same 2×6 lumber? Yes all the same wood they just attached them on both sides for the bulkier look – thanks!